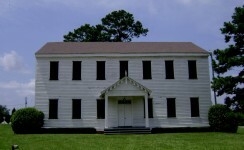 One of the most interesting spots in Dale County is, “Old Clay Bank Church.” More than a century ago it was the center of one of Alabama’s pioneer settlements and, today, stands a monument to the courage and faith of those strong men and women who endured the hardships and dangers of frontier life and blazed the trail for an advancing civilization. 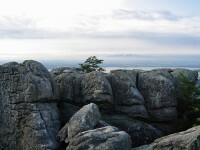 When the public lands of Alabama were opened for settlement, the southeastern part of the state received its share of emigrants, who came in from the older states for the purpose of homesteading this land. One of the earliest settlements made was along Clay Bank Creek. These settlers were, for the most part, people who were seeking homes for themselves. They had come from states having schools and churches and intensely interested in the affairs of the nation. Politics, then even more than now, was a never failing topic of conversation. It was only natural that the same interests should be brought to their new homes. At that time, the only religious services were held in the homes of the settlers and, by itinerant preachers or missionaries. Realizing the need, not only of a church, but of a place for holding meetings of general interest to the community, as well, it was decided to erect a building that should serve these purposes, and in 1829 this house was built by Curtis Byrd, his two brothers, Isaac and William Byrd, William Martin, John Merrick, William Andrews, Eli Ruffin and others. The site selected was centrally located for the settlers, about one-half mile from Clay Bank Creek, and one and one-half mile from the present town of Ozark. This was, at that time public land, and was a part of a large scope of uncut woodland. Longleaf pines, hickory, blackgum, different varieties of oak, and many of the smaller shrubs abounded. One of the essentials never overlooked when building a church or a home in pioneer days, was a natural spring with an abundant flow of pure, fresh water. 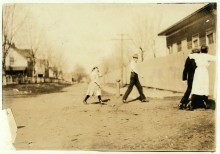 A settlement road passed along the south side of the church, and an old Indian trail on the east side. The building erected was typical of the times. Crudely constructed of round logs, it is to the present day spoken of, by some of the older people, as a “pole pen.” The covering was made of boards riven from the trunks of trees by means of a maul and froe with its proverbial dullness. The floor and seats were made of puncheons—logs split through the middle and the flat side made smooth with a broad axe. Wooden pegs were used for nails and its one door hung on wooden hinges. There was no means of heating and the cracks between the logs served the dual purpose of light and ventilation. Inadequate as the building was, it was the center of the social, religious, and political life of the community for many years. 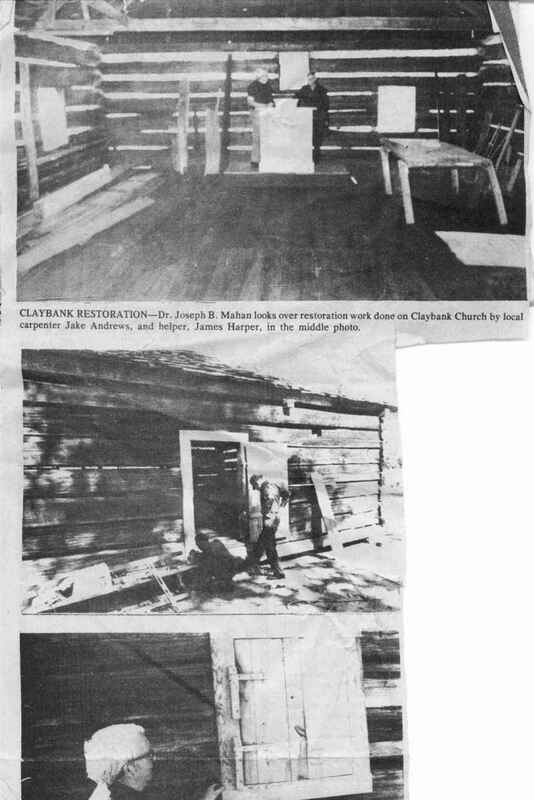 When Clay Bank Church was first established, it belonged to no sect but was open to any minister of God’s Word. “It was built before men built altar over against altar and divided the flock. Denominational differences disappeared in the desire to have a house for God and His servants.” Soon regular monthly preaching became the order of the day and the settlers came for miles around. Camp meetings were held as early as 1834 and continued until some time in the ’60’s, when a regular camp ground was established in a nearby community. 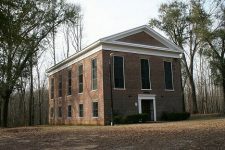 Although Clay Bank Church was first built as non-denominational, it was soon organized as a Methodist church, due, no doubt, to the fact that the majority of the settlers were Methodists, and in 1831 we find the church being served regularly by Robert Williams, one of those “hardy gospel rangers,” known as circuit riders. He was followed, in 1832, by Wesley Hunnicut. 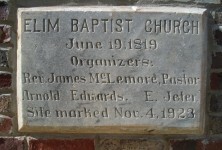 The names of others who served this church during its early years will be found in the list of pastors given at the close of this article. 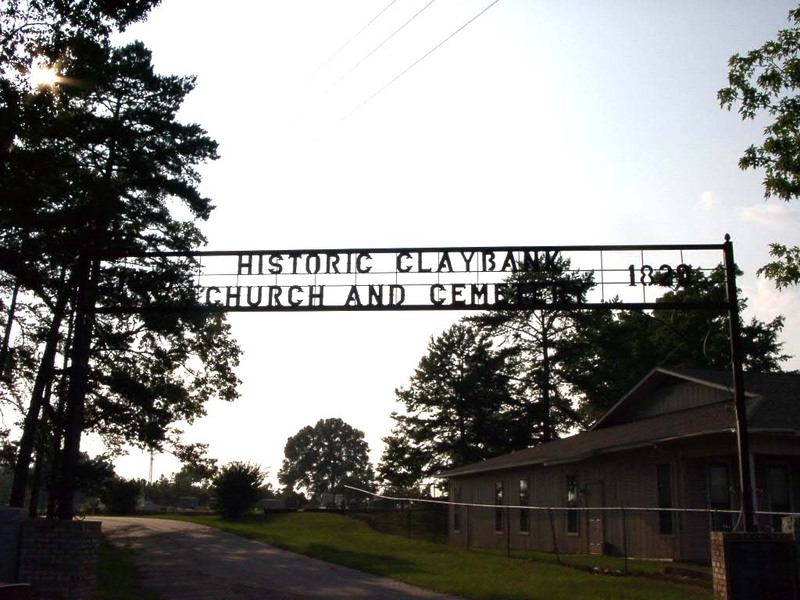 It is interesting to note that there is scarcely a break in the services at Clay Bank, even during that holocaust of “destruction and reconstruction from 1861 to 1865,” although there must have been many saddened hearts who sought comfort within its folds during that dark period. An old ledger gives a pathetic account of a funeral that was held there upon the return of the body of a young soldier. Many interesting characters were associated with the early history of Clay Bank. Doubtless, its early establishment and rapid growth were largely due to the fact that among the settlers of this community were a number of preachers who had been prominent in the religious life of the states from which they had come. Among these was Rev. John McDonald, who came to Alabama from Georgia and preached the first Methodist sermon in this section of Alabama Territory in 1818. One of the most picturesque of these was Zachariah Dowling, or “Uncle Zacky” as he was called, “who was a regular preacher and travelled through the length and breadth of the land. He was fully equipped for all kinds of weather. When ‘Dicky’ his horse, was saddled and bridled and ‘Uncle Zacky’ was mounted, he looked like a warrior going forth to conquer a kingdom. Equally interesting and no less scriptural in his life was Dempsey Dowling, brother of “Uncle Zacky” and Levi, and grandfather of Angus Dowling who was converted at Clay Bank, became a minister and served as pastor of that church in later years. Before moving to Alabama in 1826, Dempsey Dowling had been a member of the Methodist Conference of South Carolina and upon arriving in Alabama, one of the first things he and his brothers did was to establish preaching places throughout the country. He believed in a literal interpretation of the Bible and lived accordingly. He insisted upon a strict observance of the Sabbath, no cooking was permitted and the entire family walked to church in order that the stock might rest. Under the leadership of these stern disciplinarians, “men possessed of a burning zeal for the cause of the Lord,” the church at Clay Bank grew until in 1852 the membership had outgrown the old round-log house, and the present building was erected. The project was again a community affair. The land had been “entered” by Moses E. Matthews and was now owned by his son, Elisha Matthews. 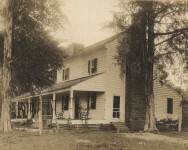 The timber for the new house was donated by Edward Bowling and every one connected with the church and community seems to have had a part in the “houseraising.” This building was placed about 40 yards southeast of the original building and was similar to it in many details. It, too, was built of logs but these were hewn flat on two opposite sides so that only the heart of the tree remained. The foundation was great logs squared and placed on wooden blocks for pillars. 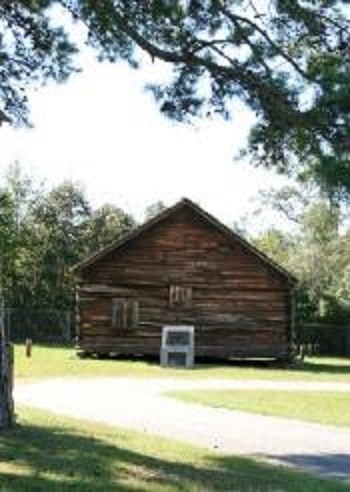 By this time a saw mill had been built several miles away and wide heavy boards were obtained from which the floors, benches and pulpit were made. However, these boards were rough and it was necessary that they be planed. All this work must be done by hand with an old fashioned hand-plane. This task was assumed by Samuel J. Andrews, a citizen of the community who owned and operated a wood-shop, in which he made all kinds of household furniture. The smoothness and sturdiness of these old pews today, testify to the skillful workmanship and the thoroughness with which the work was done. 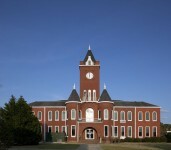 The building stands as it was completed at that time, with the exception of a few repairs in which steel nails were used. The old wooden pegs and wooden hinges may still be seen doing faithful service, while those who placed them there have long since passed on. 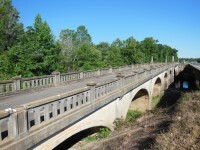 But the ravages of time are beginning to make their imprint and if this historic landmark in Alabama’s progress is to be preserved for future generations, it cannot be neglected much longer. In looking through some records of this old church, we find constantly recurring the names of Whittemore Crews, Noel Dowling, and Samuel Hallford, said to have been the first stewards, Anthony Windham, J. N. Sansbury, stewards in later years, Peeler Bowling, secretary and steward in 1868. The latter was secretary for many years and was a steward in the Methodist church until his death in 1928, a period of 60 years. We are impressed with the strictness of the rules and regulations of these churches of other days. 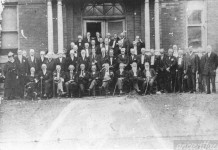 Conference was held at each monthly “meeting day,” at which time the roll was called and any one found guilty of “continued absence” had his name “stricken from the list.” Refractory members were dealt with in a summary manner. In a pastor’s report we find the following: “During the last Quarter I have visited all the members of the church, excepting a few, and find that, in the main, the members are striving in some degree, to maintain Christian character. With a few trifling exceptions, the church is in peace and friendship. However, I believe the great defect is found in the neglect of the family altar. I fear some of our members use ardent spirits as a beverage. Let us set our faces against this and pray the blessings of God upon the entire church.” We fear it was as hard in those days as it is now to stretch the “mantle of charity” to cover the weaknesses to which the flesh is heir. Remember the Friday next preceeding each quarterly conference is to be observed by fasting and prayer for the prosperity of our beloved Zion and for your servants, for Jesus’ sake.” Signed by the pastor and presiding elder. The financial reports also give us cause for thought. Most of the preachers had a farm and made a crop at such times as they were not “tending the flock.” The small remuneration that was paid was not always in cash. Under different names the following notations occur. The above items are under date of 1868. As the country became more thickly settled, the population gradually shifted from Clay Bank to what is now Ozark and in 1873, a Methodist church was organized there. 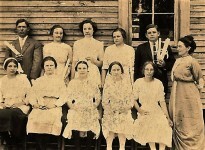 The congregation had again grown too large for its primitive building and as the land on which it stood was now privately owned, the membership decided to unite with the church at Ozark. It was hard to break old ties and some of the members remained for a long time but regular services were discontinued after 1873. Memorial services are held on the first Sunday in May of each year, but with that exception the old church stands sadly deserted. The silence is broken only by the usual sounds of the woodland. The nearby public highway, that has supplanted the one time Indian trail, seems almost a desecration. The tall pines stand sentinel, while the oaks, hickory and holly, with their brilliantly flaunted colors in autumn and their new growth in springtime, defy time, death and decay. The cemetery that has grown up on the north side of the church is as interesting as the church itself. Naturally time and the hardships of frontier life, early began to take their toll, and the logical place for the cemetery was near the church. As we pass between the rows of graves, we trace each era in the progress of the country. Small headstones mark the graves of the early pioneers, later, stately spires rise to mark the resting place of the dead, while slabs and broad monuments mark those of the new century. On the gravestones we find many names that are familiar; Dempsey Bowling, Samuel J. Andrews, Elisha Matthews, Nathaniel Skipper, Noel Bowling, Samuel Hallford, Peeler Bowling and others. Names that stand for integrity, simplicity, stability and honor characteristics upon which a great commonwealth has been founded. List of Pastors at Clay Bank from 1831 to 1873. Note: For the facts contained in this sketch, I wish to acknowledge my indebtedness to Early History of Dale County by W. L. Andrews, Methodism in Dale County by Rev. C. A. Cornell, Records of Clay Bank Church, by Peeler Dowling and also to Mr. W. E. Andrews, Miss Janie Andrews, Mr. Bert Byrd, Mr. W. E. Martin, Judge G. P. Dowling, Mrs. George D. Burnett and others. Which county is named for an Alabama Daniel Boone? Found my third great grandfather was there in 1834. 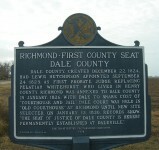 I knew he was a circuit rider in GA but didn’t know (or forgot) he also had a church in Dale Co.
I’m a descendant of Rev. and Attorney Dempsey Dowling glad to see this posting here, and the book Claybank Memories: A History of Dale County, Alabama is also a great resource. Very interesting article. Thank you! I’m a descendant of Dempsey Dowling as well as Samuel Hallford. I wondered where his son Wesley Hunicutt’s (my g-g-g grandfather) name came from. Now I know. Two of my ancestors are mentioned in this article. Dr. Nathaniel Skipper and Moses Matthews (jr) whose marker is at Ozark Baptist Church.